It has not been an easy year for Rhonda Greeson. First, a few months ago, she was diagnosed with cancer. Doctors caught it early, she had surgery and is now cancer free. But shortly after she was diagnosed, her husband was diagnosed with cancer too. He goes in for surgery this week. "It's been a hard year," said Greeson. But Greeson said her work family has been there every step of the way - sending meals, cleaning services and of course, cards from her students. And her work family - they know how much she's going through. 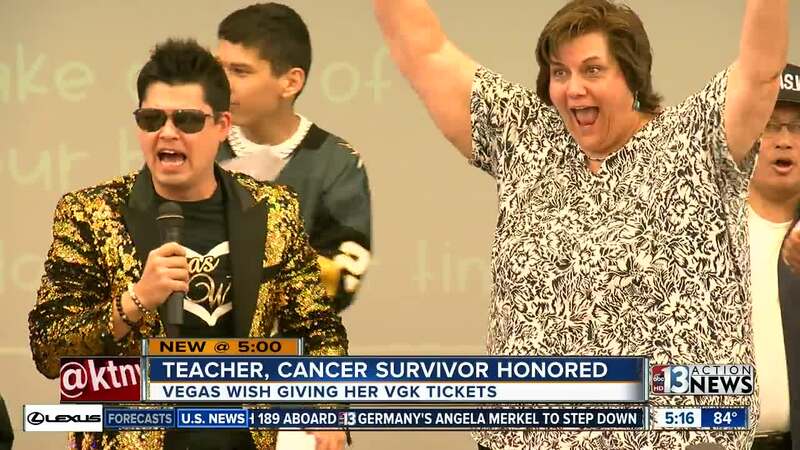 That's why they nominated her for Vegas Wish, a non-profit that grants wishes of deserving locals. "My own daughter comes here to school and Ms. Greeson is her favorite," said Cassie Perrone, the teacher who nominated her, "she's just a huge part of our community here and just so, so deserving." The co-founders of Vegas Wish said choosing Ms. Greeson was a no-brainer. "The fact that not only has she gone through her own troubles and her own hardships, to still come back here as soon as she was clear to come back to the kids, to bring music back to the halls, but that was also inspiring to me," said Vegas Wish co-founder Chris Romleski. This morning, the entire school - every child a student of Ms. Greeson's - came together to honor, celebrate, and encourage her to continue the fight. "I'm part of this and they're part of me and today that was just a nice reinforcement of that," said Greeson. And that wish they granted? Tickets to a Vegas Golden Knights game. "I can't wait to see my first game!" said Greeson.